RUSH: I want to circle back here to the tax cut. We spent some time in the previous hour describing the amazing decisions made by Apple. And Amazon, by the way, is now getting in on the act. Amazon is looking for new headquarters, 20 different cities. They’re talking about all kinds of investment too. Once one of them starts it, the others get right in line. I’m telling you, this economy has just been ignited. We’re not even anywhere near at full thrust yet. But I have a belief. You know, the Democrats do not trust you. Big Government types don’t trust average, ordinary citizens to live their lives the right way, to make the right decisions with their money, raise their kids the right way, to think about things in the right way. Liberal Democrats demand that they make decisions for people based on their contempt for average, ordinary people. It’s part of the arrogant, condescending attitude that liberal Democrats have. Their utopia, by the way, is predicated on the fact that you have no choice. Their utopia exists only when they tell you what you can and can’t do, and offshoots. See, I believe something differently, folks. I’ve always believed this, but my belief in these things I’m gonna share with you in a moment are the direct result of 30 years, 29 years doing this program with you as the audience. This is the best audience in media for a whole bunch of reasons, but among them you’re the best audience in media for inspiring me about our country, its status, and its future. With people like you in it, I can’t help but be optimistic. Democrats and Millennials and leftists are raised with the belief, they’re taught that corporations are evil, that they’re mean, that they’re not even really people. And that they only care about profit, they don’t care about people. They shortchange everybody on health care. They make cheap products and they overcharge. And then some companies make products that kill their customers. And some companies don’t care if their customers get sick and when their customers do get sick they don’t try to make ’em well. They try to cover it up. You know the drill. Corporations are destroying the planet, they’re killing the American people and people the world over. They are depleting the environmental of the polar bear. You get the drift. This is how young liberal Democrats are raised. And so what is happening as a result of these tax cuts, we’re up to 200 companies now between a thousand dollars and $2,500 in bonuses and wage increases and higher starting hourly wages, expanded benefits, and I believe that’s because of the basic virtue that exists here among a free people. These are voluntarily given bonuses and raises. The government’s not making ’em do it. The government’s not forcing this. Barack Obama didn’t make this happen. He’s not responsible for any of this. I have to take a break. I want to finish the thought before we talk with somebody else. 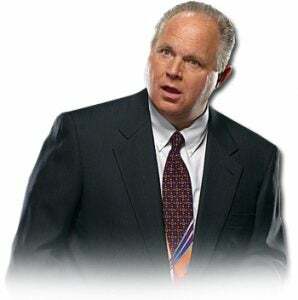 RUSH: The bottom line is the government got out of the way, and look at what happened. Government got out of the way, stopped micromanaging and controlling and basic virtue occurred. These corporations did not have to do this. Nobody made them do this, from Apple on down to JPMorgan Chase. But they did it. And with what money did they do this? They did this with money that otherwise would have been sent to Washington via taxes. They didn’t take this from the profit line. They got a massive tax cut, and contrary to what everybody in the mainstream media told you they were gonna do with it — what’d they tell you? They’re gonna keep it. They’re gonna keep it for the shareholders. They’re gonna keep it for dividends. They’re gonna keep it for the CEOs. They’re gonna keep it for performance money. They’re not gonna give this to the workers. It never happens. 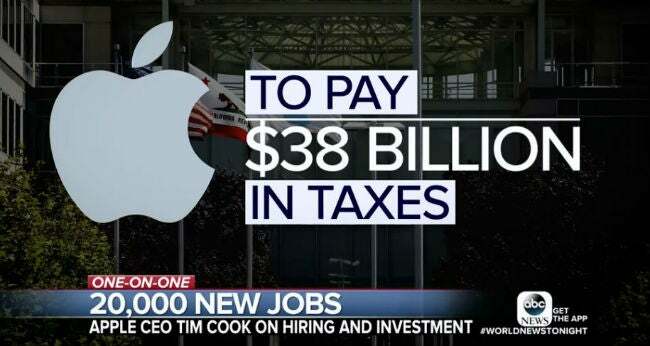 And here it’s happening, with one of America’s biggest corporations leading the way, Apple incorporated. So what are these leftists gonna say? And there’s nobody that made them do it. Trump didn’t make ’em. This was not part of the deal. No. Don’t misunderstand. I’m not saying that there’s nothing inherently wrong with corporations. I’m not an idiot here, folks. No two things are ever the same. You’ve got bad people and good people in every group of people. My only point here is government got out of the way, and they ended up with more money from Apple alone, $38 billion, as a result of a tax cut, and people that work for these corporations are getting significant bonuses and wage increases. The companies did the right thing, the companies that are doing this, with the additional money they had. RUSH: Look at this! Greetings, folks. Great to have you back. It’s Rush Limbaugh, executing assigned host duties flawlessly, all with talent on loan from God-d. This is a USA Today story. Ready for the headline? “401(k) Investors: Is Dow 26,000 a Sign That Stocks Are Getting Risky?” Is all of this subzero weather a sign of global warming? Is the Dow at 26,000 a sign that stocks are getting risky? The sub-question is, is the market going up too fast? “The Dow’s record-fast sprint to 26,000 early in the new year is raising concerns –” With who? With who? “– that the stock market may be in danger of overheating.” Do we ever hear anything like this when there are Democrat administrations and they’re trying to tell us that there’s good economic news, do we ever hear that it may be too good, that it may be too much, that it may be happening too fast, that it may just mean the bottom is getting ready to drop out? I think these people are backwards. I don’t think that we had a legitimate — what they call it, a nine year bull market — we had a nine year bull market because Obama was funneling money into it. It was called quantitative easing and they were printing money at the Federal Reserve and funneling it into agencies that ended up buying securities with it, stocks essentially, but it wasn’t the result of economic activity. This is! I think we had eight years of stagnation. And if Obama hadn’t been printing money and funneling it to the Federal Reserve, therefore from the Federal Reserve to the equity markets, that we wouldn’t have had a stock market rising. They couldn’t show positive economic activity anywhere during the Obama administration because there weren’t any Obama policies that would allow the economy to roar. We had eight years, if you want to know the truth, we had eight years of genuine, real economic stagnation, and now we are in the first phase of a recovery bull market. And the growth in the stock market now is legitimate. People’s already invested money is growing, new money is coming in because of the growth. Look at all these companies that are paying bonuses with money they didn’t have during the Obama administration. I mean, the media is desperate, the Democrats — remember, I think the media runs the Democrat Party. I think the Democrat Party echoes what the media leads with. You could argue about that, but they’re one and the same no matter who is running the show. And they had to do everything to create the illusion that we were growing and there was sustainability and all these wonderful economic things when Obama was president, when it was going the exact wrong way. Wages were stagnant. Remember all the stories, nine years, eight years of stagnant wages, job losses and Obama saying the jobs weren’t coming back, telling us this was the new decline, this was the new normal. He was the steward of the decline, that all that American growth from the eighties through the nineties was not legitimate. It was unjust, it was immoral because it was ill-gotten, however Obama wanted to define it, ’cause the mission was to downsize the United States overall and make it just one of a number of nations making up the global enterprise. And now all those shackles in under a year have been removed. It’s why I spent some time in the last hour talking about my belief that a free people are virtuous. I still have faith in basic humanity. I think people get weird and do strange things when their freedom is limited, whether they’re aware of it or not, subconsciously or not. You can’t have a growing federal government with massive, oppressive regulations and limits on freedom, limits on behavior, like we had during the Obama administration, and have happy people. In fact, I think something else. I was thinking about this. We had this caller from New Jersey who said she was in a bar, very liberal town, every town in New Jersey is liberal for the most part. She’s in a bar, and Trump’s face came up on CNN, and all the libs in there started talking about how great their 401(k)s are doing, how they’re up 19, 26, 38%, and they can’t wait to see what happens with their finances because of the tax cut coming in. There was not nearly as much vitriol aimed at Trump. What was the story we got on Obama all eight years? Smartest, most sophisticated, calm, cool, collected, just in total control, just silently brilliant, well-mannered, refined. And what do we get with Trump? The exact opposite, bull in a china shop, unsophisticated, a rogue, uneducated, illiterate, can’t read, early onset Alzheimer’s or dementia or what have you, obese, on the verge of getting a heart attack and dying, doctors lying about his health. I mean, you know the drill. I think it’s exact opposite in every which way. I think Trump is 10 times as smart as Obama, I think he’s 10 times as aware. What is Obama? Nothing more than a package. He was a package created by people like David Brooks. “The crease in his slacks,” wrote David Brooks, “convinced me he was going to be a great president.” He was serious. We had to sit here and we had to put up with that kind of so-called conservative brilliance. But can somebody name for me anything that Obama said or did that today is memorable? I’m talking about great speeches like we remember JFK, “Ask not what your country can do for you, ask what you can do for your country.” Do we remember anything? I mean, we all have bad memories of Obama, but I mean statesman-like orations or speeches or proclamations. There isn’t any. Everybody said, we were told that Obama was brilliant, so smart, we couldn’t even keep up, he was so far ahead of us that the best we could do was try to bask in the glow, but keeping up was just not possible. And yet Obana was right out of Saul Alinsky’s book. If Fauxcahontas came along and said, “You didn’t build that,” Obama picked it up and copied it. All he did was utter leftist bromides, little bits of philosophy and policy. The brilliance of Obama was something we were told existed. We didn’t really see it. Unless brilliance is proper pauses when speaking and using certain words and having a little bit of an arrogant air, as though you’re above everybody. But Obama didn’t know diddly-squat about anything that he was touching. He never had a job in the private sector. He’d never made a payroll. He doesn’t know how business works ’cause he resents it. I think we were sold the biggest bill of goods. And of course you couldn’t criticize any of it because of his race. If you did, you know what happened to you. With Trump, we’re told the exact opposite. The guy is a lamebrain, he’s stupid, he can’t read, he doesn’t read, he sits on the bed and eats Big Macs and scarfs French fries while watching Fox News. And yet when you look at Trump’s policies, the things he says about policies, the things he’s implementing and so forth, A, he improvised an hour and a half three or four times a day during his rallies. His presidency has been an attempt to implement every one of those promises. And he has succeeded on a number of them, wildly more so than any other conservative president in our lifetime short of Reagan. He’s gotten more done in a positive nature for this country than anything that happened in eight years. This is why I continue to say we need to redefine smart, because it’s not Obama. That’s an illusion. That’s packaging. Based on the fact that he has Ivy League language down. He has Ivy League mannerisms and character down pat. And that’s how they define smart. And it’s easy to look smart when a salivating press corps loves you. Some of the inane questions that he got. “Can you tell us what you dream about each night?” I can’t even remember, so vacant and embarrassing.